Birchwood B&B was exactly what we were looking for: great location for an easy drive around the Ring of Kerry, large rooms, very clean and an incredible host. We would strongly recommend Birchwood! It was a delight to stay here. Birchwood was a great location--very close to Kenmare, beautiful home and wonderful breakfast. Rooms are upstairs Although we didn't have any issue with water pressure we were told to stagger showers since the water system was connected with other rooms. My son and I had a wonderful 5 day stay a Birchwood. It is clean, the food is excellent and Tom MacDonnell is professional and helpful in all ways. Use the money you save on lodging at Birchwood to have a good time in Kenmare about 10 minutes away. The room was good and the breakfast superb. The owner, Tom, is very helpful with advice on walks in the area. Also access to Killarney and Kenmare is easy. A wonderful place on a beautiful spot! The best breakfast, every morning again! Tom gave me a lot of good advice to visit the environment. I will certainly go back if I return to Ireland! Located in the country at 10 minutes from Kilgarvan in a quiet place. The staff was kindly and give us some tips about our journey in kerry. Good breakfast. We stayed 2 nights at Birchwood B&B because it`s such a beautiful place and the quality is perfect. We have chosen this B&B because we stayed there just one year ago. The service and Breakfast is delicious and Tom is always very helpful. Accueil chaleureux dans un environnement calme et reposant. Les petits déjeuners étaient d'excellente qualité et Tom, notre hôte, nous a conseillé utilement pour visiter la région. Really enjoyed stay, Tom the owner was a lovely man & couldn't have been more helpful, Would stay here again. Tom provided us with a really warm welcome, and lots of useful advice about what to see and where to go. The area has so much to offer that we regretted having booked only 2 nights, and would gladly have stayed more. We left with good memories, some fruits and homemade cake to see us on our way ! Great Experience - Tom is an exceptional host who goes out of his way to make you feel welcome. Highly recommended. Easily the best B&B we stayed at during our week in Ireland. The breakfast in particular was amazing. A very helpful host and comfortable B and B. I would recommend it to anyone who wanted to explore that area. Tom is happy to lend maps and tell you the best places to go, and he cooks a good breakfast too. Our three nights at Birchwood were exceptional! Very comfortable, lovely accommodations and a gorgeous setting. Excellent location. Tom is the BEST host we had on our 24 day vacation....friendly,informative, helpful, great sense of humor and what a cook! We highly recommend this bed and breakfast and wish we could've stayed longer! Our host was attentive and very helpful in planning day trips. Beautiful garden, room confortable. Breakfast very good with high quality food. 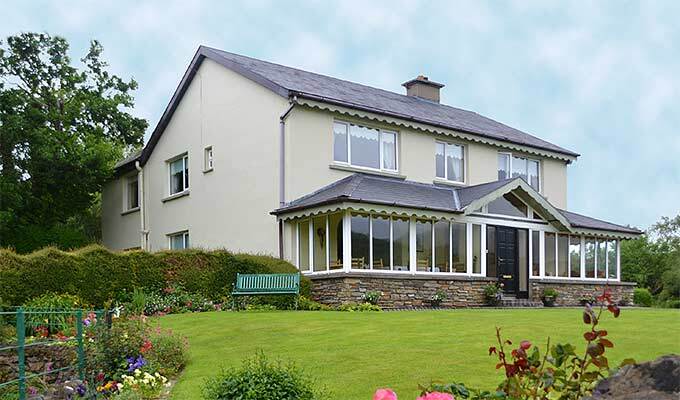 Excellent b and b: peaceful location , ideal to discover the ring of Kerry, Dingle and Beara Péninsula. The house is very comfortable, cosy and tastefully decorated and the garden is fabulous! Tom is a very nice host and he will do his best to make you feel comfortable, he also gives excellent advice on what to visit in the area. As for the breakfast, it is excellent and the choice of food is amazing. In short, don't hesitate! Tom is a fantastic host. Especially if you have Irish heritage, he is a marvel at getting information. Thanks heaps. Also nicely secluded for relaxing but everything you need is just around the corner. Very peaceful location, lovely views and gardens and well appointed room. We were made to feel very welcome and served a first class breakfast every morning. We had a wonderful stay here. We rented two rooms. One for my husband and I and the other for our three adult age children. It was a beautiful setting and we enjoyed the gardens and the cows in the field next door. Also enjoyed the wonderful Irish breakfast too. Definitely would stay here again! Very much enjoyed our stay. Thomas puts out a delicious breakfast! Would stay here again if I am in the area. Mr. MacDonnell was a great host, very helpful in planning day trips. The rooms were excellent, clean, spacious, with a great view of the Kerry Mountains. Tom makes a good Irish breakfast with tasty muffins. I have stayed at Birchwood before and will again when I am in Kerry. A wonderful place to stay. Excellent breakfast and Tom is a very good host. An amazing B&B! A welcoming and helpful host that gives advince for the trip. Delicious breakfast with the possibility to ask something else every morning. The room was clean and the bed very confortable. The B&B is at a calm place, but not far away from Kilgarvan. A huge thanks to Tom for beeing able to see the Skellig Islands thanks to him. I can only encourage to go there, it is a very nice B&B. I booked Birchwood for a group of nine eight adults and one three year old family members. Our experience was outstanding. Tom did a wonderful job of hosting our large group. He was able to help us with sights and directions, assisted with any questions we had, and served possibly the best breakfast in all of Kerry. We stayed for three nights and thoroughly enjoyed the accommodations and the tranquil setting and beautiful grounds. If we are blessed with the opportunity to make another trip to Ireland we will be looking to book Birchwood again. Excellent place to stay: friendly, warm welcome, spacious room, very good breakfast with home made bread. Good advise for trips in that region. This was best B&B we had during our holiday-travelling in Ireland and we had good ones. An excellent place to stay with a welcoming host. Extremely enjoyable. Thanks to our host Tom for the wonderful breakfast menu, tea, coffee, cakes and the great advices for the trips to the nice places of Co. Kerry. It was our best stay in Ireland. I took my first trip to Ireland in May and my friends and I decided to just pick B&B's at random. As luck would have it we landed in Kilgarvan at Birchwood. From the beautiful accomdations complete with a good view to the Irish breakfast and the grounds and garden it was a wonderful experience and one we hated to leave. Tom has a dry sense of humor and he was also very helpful when it came to pointing out the best places to go "off the tourist path". I'd rate it a 5. A beautiful house with a beautiful garden. The gentleman very kind and friendly. Well located to do the south of the Island. A fantastic stay, we will be back again.